Singapore: US President Donald Trump shook hands with Kim Jong-un of North Korea on Tuesday and offered a major concession during their nations' first summit meeting, a momentous step in an improbable courtship between the world's largest nuclear power and the most reclusive one. Brash, impulsive leaders who only a few months ago taunted each other across a nuclear abyss, Trump and Kim set aside their threats in a gamble to show that for now, at least, personal diplomacy can counteract decades of enmity and distrust. Emerging from a day of talks in Singapore, Trump said he was suspending joint military exercises with South Korean forces. Asked if Kim had agreed to denuclearise, Trump said he expected the process to start "very, very quickly" and it would be verified by "having a lot of people in North Korea". He said Kim had announced that North Korea was destroying a major missile engine-testing site, but the economic sanctions on Pyongyang would stay in place for now. Trump's decision to suspend the war games - which he described as "very expensive" but also "very provocative" given the continuing negotiations - appeared to take South Korea by surprise. It was the latest twist in the international drama over the fate of the North's nuclear programme and a complete reversal by the Trump administration, which had previously said the exercises were important to defend an ally and not negotiable. It was also a remarkable bet by Trump that he can persuade Kim to follow through on pledges to surrender his nuclear weapons that are almost identical to those the North had made - and broken - in the past. "We're very proud of what took place today," Trump said. "I think our whole relationship with North Korea and the Korean Peninsula is going to be a very much different situation than it has in the past." In a televised ceremony in which the two leaders signed a joint statement, Kim thanked Trump for making their face-to-face talks possible. "We had a historic meeting and decided to leave the past behind. The world will see a major change," he said. In the statement, Trump "committed to provide security guarantees" to North Korea and Kim "reaffirmed his firm and unwavering commitment to complete denuclearisation of the Korean Peninsula". But the statement did not go much further than previous ones and was short on details, including any timetable or verification measures. It said the two nations would hold "follow-on negotiations" led by secretary of state Mike Pompeo and a high-level North Korean official "at the earliest possible date, to implement the outcomes" of the summit meeting. It said the two countries would "join their efforts to build a lasting and stable peace regime" on the divided peninsula, meaning talks to reduce military tensions that could eventually lead to a formal peace treaty to end the Korean War. The day had begun with a carefully choreographed encounter in which Trump and Kim strode towards each other, arms extended, in the red-carpeted reception area of a hotel. Trump put his hand on the younger man's shoulder. Then the two, alone except for their interpreters, walked off to meet privately. Later, as they reconvened with top aides, Trump declared of the nuclear impasse: "Working together, we will get it taken care of." Kim responded: "There will be challenges ahead, but we will work with Trump." Their negotiators had failed to make much headway in working-level meetings before the meeting, leaving Trump and Kim with little common ground ahead of what could be months or even years of talks. But this was a negotiation that followed no known playbook: Two headstrong men - one 34 years old, the other 71, products of wealth and privilege but with lives so dissimilar they were practically from different planets - coming together to search for a deal that had eluded their predecessors. 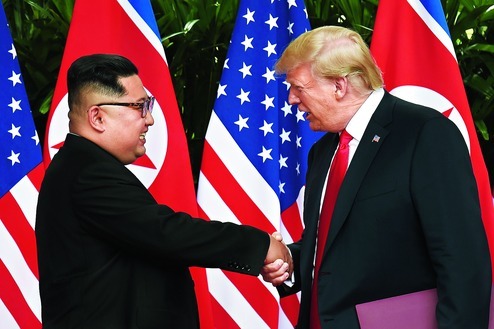 American and North Korean diplomats were, however, struggling to bridge gaps on some of the most basic issues dividing the two sides, including the terms and timing under which the North would surrender its nuclear arsenal. South Korea's President, Moon Jae-in, who had worked intensely to broker the meeting, said: "Even after the two heads of state open the gate, it will take a long process to achieve a complete solution. We don't know how long it will take: one year, two years or more." Several experts said the meeting had failed to secure any concrete commitments by Pyongyang towards denuclearisation. Nor did the joint statement refer to human rights in one of the world's most repressive nations. Trump said he had raised the issue of human rights with Kim, and he believed the North Korean leader wanted to "do the right thing". He added that US college student Otto Warmbier did not die in vain, for his death had helped initiate the process that led to the summit. Warmbier died last year, days after he returned to the US in a coma after being released from North Korean custody.